"The first rhododendron festival, in 1946, was a joint effort of the Citizen’s Club of Roan Mountain, Tennessee, and the Bakersville Lions Club in an effort to promote tourism and draw attention to the 600 acres of Catawba rhododendron on Roan Mountain. As attendance increased, it soon became necessary for each state to hold a separate festival, and in 1952, the first North Carolina Rhododendron Festival took place. Since then, Bakersville, a village nestled at the base of Roan Mountain, has hosted the North Carolina Rhododendron Festival. After seven decades, the festival continues to hold the distinction of being among the oldest and most respected festivals in the Southeast, confirming its potential to endure as long as the mountain itself. 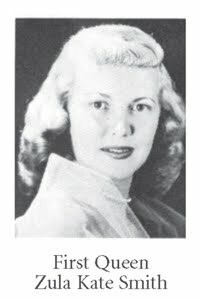 In 1952, Zula Kate Smith of Burnsville became North Carolina’s first Rhododendron Queen."